This book and the symposium on which it was based were designed to cross the boundaries of subdiscipline and theoretical orientation to address four critical issues in understanding development: explanation of change and development; the nature and process of change; forms of variability in performance; and the promotion of change through application. The chapters suggest that change and development in target systems from cells to selves, may not be explainable, assessable, or promotable without careful reference to the context (social and otherwise) of the system, and that the process of change and development may involve variability of the system in addition to periods of stability. Together the chapters harken back to the spirit of the grand theory. Instead of proposing a grand theory, they provide an excellent foundation for considering the importance of an individual's (or particular group's) context and variability, and discussions to facilitate thinking about what still needs to be worked out. Contents: K.A. 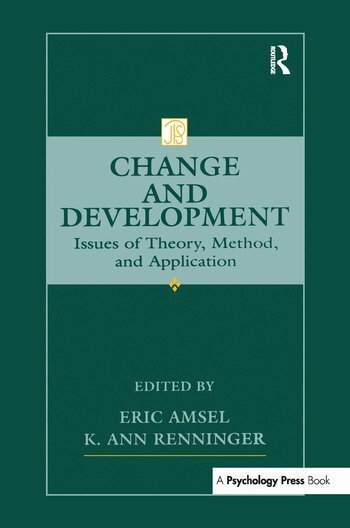 Renninger, E. Amsel, Change and Development: An Introduction. Part I:Foundations of Change and Development. M. Chandler, Stumping for Progress in a Post-Modern World. J. Valsiner, Constructing the Personal Through The Cultural: Redundant Organization of Psychological Development. J. Meacham, Autobiograpyhy, Voice, and Development Theory. Part II:Nature and Process of Change and Development S.F. Gilbert, S. Borish, How Cells Learn, How Cells Teach: Education in the Body. R.S. Siegler, Concepts and Methods for Studying Cognitive Change. K. Nelson, Cognitive Change as Collaborative Construction. K.W. Fischer, B.P. Kennedy, Tools for Analyzing the Many Shapes of Development: The Case of Self-in-Relationships in Korea. Part III:Variability, Change, and Development. L.B. Smith, Metaphors and Methods: Variability and the Study of Word Learning. R. Bakeman, L.B. Adamson, M. Konner, R. Barr, Sequential Analyses of !Kung Infant Communication: Inducing and Recruiting. P. van Geert, Variability and Fluctuation: A Dynamic View. J.B. Willett, Measuring Change: What Individual Growth Modeling Buys You. Part IV:Learning, Changing, and Developing. M. Cole, Cultural Mechanisms of Cognitive Development. B. Rogoff, Evaluating Development in the Process of Participation: Theory, Methods, and Practice Building on Each Other. W. Damon, Learning and Resistance: When Developmental Theory Meets Educational Practice. "...the Amsel and Renninger book meets its goals admirably--every chapter is a good read that presents state-of-the-art material to the broad readership in the field. I learned something of value from every chapter." "Taken as a whole, the book's chapters make a welcome case for the role of theory in developmental research." "...I would like to stress that [the] book implicitly and explicitly offer[s] teaching strategies that are appropriate for learners of all ages. I believe the strategies are useful because of the disciplined theoretical grounding found in the writings which explicate the coherence of the instructional interactions, with attention paid toward cultural and social contexts, explicit and implicit goals of the diverse learning activities, as well as the acute concern that the researchers have for the learning, change, and development of children."